Thanks everyone for joining us and for your questions! Remember to follow us on Twitter and Facebook for future live chats! Only 3 minutes until the end of the live chat - last chance to ask your questions! And another bonus pic with Katherine! Mr Harry Shum Jr with a question! Will Emeraude answer...? @EmeraudeToubia what's your favorite song that you could play on repeat for all of eternity? Matthew with his now customary question! #askemeraude @EmeraudeToubia what animal would make the worst shadowhunter? And Katherine gets her answer! Only 5 minutes to go! Last week's live chat star has already got her question in! Not long to go - ask your questions now! 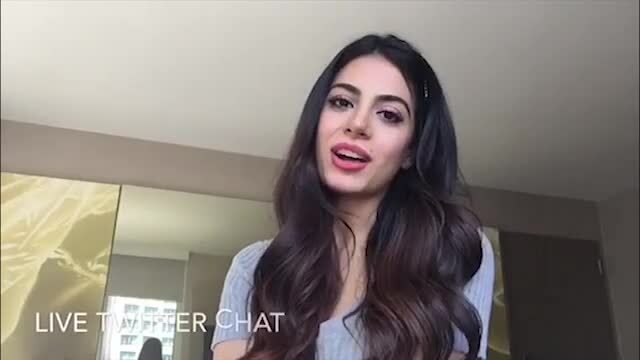 Emeraude Toubia (@EmeraudeToubia) will be answering questions LIVE from the Shadowhunters set on Twitter this Tuesday, July 28th, at 3pm EST/12pm PST! Tweet your questions using #AskEmeraude and we will feature all the answered questions on the site! Don’t forget to check back here during the chat as we’ll be reporting live on her answers – and we will be sure to get some exclusive photos during the live chat too!